Israel is no democracy. It deplores democratic values. It ignores rule of law principles. Non-Jews aren't wanted. Muslims are ruthlessly persecuted. They're terrorized. Praying to the wrong God is criminalized. Last week was like all others. Israeli soldiers murdered 29-year old Odeh Jihad Hamad in cold blood. He was well inside Israel's imposed border zone with Gaza. Soldiers shot him in the head. They prevented ambulance help from arriving for around 90 minutes. They wanted to be sure he died. They wanted him to suffer if it took time. In Jerusalem, Palestinian resident Hadassah Ein Karem was on his donkey. He was traveling along a bypass road. It's adjacent to al-Isawiya village. He was in plain sight. A settler ran him over. He was critically injured. At Hadassah Ein Karem Hospital, he was pronounced dead. In Jenin's refugee camp, Israeli soldiers fired on nonthreatening Palestinian civilians. One was killed. Another six were wounded. Israeli naval forces opened fire on Palestinian fishermen. They were nonthreatening. They were in Gazan waters. It didn't matter. These type incidents happen often. Sometimes Israel damages fishing vessels. Other times they're confiscated. This time fishing equipment was stolen. Israel apparently considers fishing a crime. Harming Palestinian well-being goes unpunished. Impunity is rubber-stamp. On Friday, Israeli soldiers attacked peaceful Palestinian protesters in Bilin, al-Masara and Nabi Saleh villages. They used rubber bullets, tear gas, and stun grenades. Dozens were injured. Israel considers all protests illegal. Palestinians want occupation ended. They want stolen land returned. They want Israel's apartheid wall demolished. They want the right to live free on their own land in their own country. They want world community support. They want Israel held accountable for high crimes of war and against humanity. They want long denied justice. Ta'Ayush is an Arab Jewish partnership. It seeks togetherness "to end the Israeli occupation and to achieve full civil equality through daily non-violent direct-action." Ta'ayush is Arabic. It means living together. It's a grassroots movement. It was founded in fall 2000. Activist Arabs and Jews work cooperatively. They're "surrounded by walls and barbed wire: the walls of segregation, racism, and discrimination between Jews and Arabs within Israel; the walls of Apartheid, closure and siege encircling the Palestinians in the occupied West Bank and Gaza Strip; and the wall of war surrounding all inhabitants of Israel, so long as Israel remains an armed fortress in the heart of the Middle East," says Ta'ayush. Its members work actively against racism and segregation. They're building "a true Arab-Jewish partnership." They "strive for a future of equality, justice and peace." They do so "through concrete, daily, non-violent actions of solidarity to end the Israeli occupation of the Palestinian territories and to achieve full civil equality for all." The lives and well-being of millions of occupied Palestinians have been "subordinated to Israeli interests for more than 40 years." On Sunday, Haaretz columnist Amira Hass headlined "IDF barred Israeli activists from West Bank." Ta'ayush members came to protect Palestinian farmers. They've been doing it for 13 years. They accompany "dozens of (West Bank) Palestinian shepherds and farmers...every Saturday…"
They do it to protect them from extremist settlers. They attack Palestinian farmers in their fields. They destroy their crops. They commit other forms of vandalism. They commit violence. They do so with virtual immunity. Israeli security forces do nothing to stop them. On Saturday, soldiers "separated the cars of Ta'ayush members from the rest of the Israeli cars entering the West Bank through the checkpoint on the Tunnel Road (Route 60) and the Betar checkpoint," said Hass. When they reached it south of Jerusalem, Border Police stopped them. They "showed them a military order." It was "signed by the commandeer of the Etzion Regional Brigade, Col, Amit Yamin, restricting their movements." Soldiers told Ta'ayush activists they were waiting for another military order to arrive. They ordered them to remain at Betar checkpoint until it did. When it failed to come, activists "passed through the checkpoint on foot. Soldiers and police officers pursued them." Some Ta'ayush members reached south Hebron Hills. They were shown documents declaring Palestinian land closed military zones. Judea Brigade commander Col. Avi Balut signed them. His order read: "No person shall pass through the checkpoint except with permission given by me or a person authorized by me." "The IDF is responsible for maintaining law and order in Judea and Samaria." "Every week there are provocative gatherings in the area of Sussia and Mitzpe Yair, which have at times led to violent confrontations between residents of the area and even with the security forces." "In accordance with the assessment and security considerations, it was decided not to allow free passage to all the buses, which, according to the assessment, were carrying people who were liable to disrupt public order, and to examine their entrance individually at a number of checkpoints in the southern area of Judea and Samaria." Palestinians are barred from their own land. Activists trying to help them are blocked. Other times they're attacked. Often they're injured, arrested, and detained. State terror is official Israeli policy. So is institutionalized racism. Israel ruthlessly persecutes African migrants. They come seeking safe haven asylum. They fled repressive countries. Israel treats them like criminals. "Person(s) who owning to a well-founded fear of being persecuted for reasons of race, religion, nationality, membership of a particular social group or political opinion, is outside the country of their nationality, and is unable to or, owing to such fear, is unwilling to avail him/herself of the protection of that country." •	pose no danger to others. Israel's 1950 Law of Return grants all Jews worldwide the right to emigrate to Israel. Non-Jews aren't wanted. No refugee law exists. Israel rejects non-Jewish refugees. It scorns them. It persecutes those arriving. Their fundamental rights are denied. They're summarily detained. They held for extended periods. It's under extremely harsh conditions. International law legally and morally obligates Israel to treat refugees humanely. Official state policy brutalizes them. 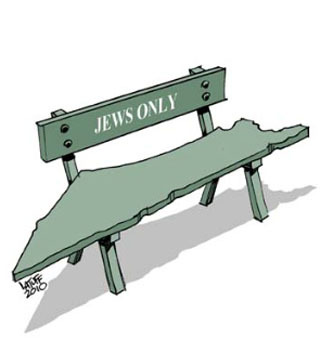 Israel's Infiltration Law is draconian. It calls non-Jewish migrants and asylum seekers criminals. They face harsh detention without trials or deportation. Anyone caught helping them is liable. They face up to 15 years imprisonment. They do so for being good samaritans. The Association for Civil Rights in Israel calls its Infiltration Law brazenly undemocratic and shameful. It's "draconian and immoral." Its "entire purpose is to deter refugees from entering Israel." It "blatantly disregards Israel's most basic commitments as a member of the community of nations and as a signatory to the Convention Relating to the Status of Refugees." Israel's longstanding inhospitable history is appalling. African migrants perhaps suffer most. Even some Jewish ones are unwelcome. Israel wants white ones. Black ones are persecuted like Muslims. On December 19, dozens of African migrants left Holot detention center. They marched toward Be'er Sheva. They did so in protest. Immigration Authority officers arrested many. They returned them to detention. Others scattered into desert areas. Security forces are pursued them. Migrants began marching after hundreds of other detainees did so toward Jerusalem. They did it to protest Israeli repression. They didn't seek safe haven status to be persecuted. "Our stance is clear," said one migrant. "Either grant us asylum or give us to an international refugee agency." Haaretz columnist Gideon Levy calls Israel's problem "racism." It's a separate, unequal society. It mocks fundamental human and civil rights. It's one of the world's most repressive states. It considers Muslims existential threats. It treats African migrants the same way. Netanyahu was never "caught expressing compassion," said Levy. Interior Minister Gideon Sa'ar "seems to enjoy being cruel." He "project(s) the kind of attitude that in Europe comes (from) gangs of skinheads." Israeli society "is so tainted by racism that the agitators of the extreme right reflect its spirit almost without question." "Africans must be gotten rid of, in any way or by any means," they believe. They're not "really human beings." There's "no place for them here." They "bring us only crime and disease." It's OK "to abuse them, humiliate them and increase their misery without limit." Rule of law principles don't matter. Israel's problem isn't security. It's Zionist fanaticism. It's racism writ large. It's believing Jews alone have rights. Others don't deserve them. Human dignity doesn't matter. Right-wing extremists govern Israel. They menace the entire region. They threaten world peace. They're waging slow-motion genocide on Palestine. Crimes of war and against humanity continue unabated. Anyone not Jewish is fair game. Why do you keep posting this crap. Would you post stuff from any of the local white supremest parties, or from Al Sharpton? How is Mr. Lendman so different? How many Jews serve in the Palestinian army? How about the Jordanian army? How about any Arab army? How many Christians serve in those armies? How many synagogues are in any Arab country. How many Churches in any of those countries? In those countries where there is a Christian presence how many have more Christians this year than the last. How many do not fear for their lives? Now compare those figures for Christians and Arabs in Israel. I will give you 10 to one odds and put up $1000 that by any number that you specify as percentages that the Israelis have at least twice the minority representation as any Arab country where, after they kill the non Muslims, they start killing each other. Your basic problem is that you yourself are an anti Jewish racist piece of excrement who would have fit right at home running a death camp. Speaking of death camps you would think that of all people in the world that Jews would know how to conduct an extermination, and yet the percent of Jews in Israel is shrinking. I notice that none of your columns features actual numbers. Maybe that is because pieces of crap are not good at basic math. Oh, and if the Arabs are treated so badly why do they not move to one of their countries??? but where will the Jews go. The gas chambers? Lendman, like many blind commenters, only sees one side. He never points out what the Islamic states are doing and have done to Jews (and now Christians). And he ignores how the Palestinians have been treated by their own brethren. The Islamic aim is to clear the entire area of non-Muslims--it's their stated policy--but no one ever calls that an apartheid policy. Why this site continues to carry his crap, I don't know; the only explanation is it is just as bigoted. I took a sip of my coffee and answered. “And this land that you are talking about – where exactly is it?” asked the MK. I decided to take a minimalistic approach. “From the Euphrates to the Nile,” I said and waited. “You are right. That’s what it says in our Koran – that the Land of Israel belongs to the Jews.” “But you are a liar!” the Arab MK continued, surprising me. Our conversation had taken a very unexpected turn, and I wanted to be sure that I understood him correctly. I believe the Prime Minister. Binyamin Netanyahu is not Ariel Sharon. He has been honest. He has spoken about the Two State Solution at the most respectable venues in Israel and overseas and has remained firm in his stand. But even if he retreats to the Histadrut building, he will not have peace.